ISLAMABAD: The second tier of Pakistan-China-Afghanistan trilateral dialogues is being held today (Saturday) in Kabul aimed at discussing regional peace and strengthening economic and counter-terrorism cooperation. Foreign Minister Shah Mehmood Qureshi reached Kabul earlier for the talks. 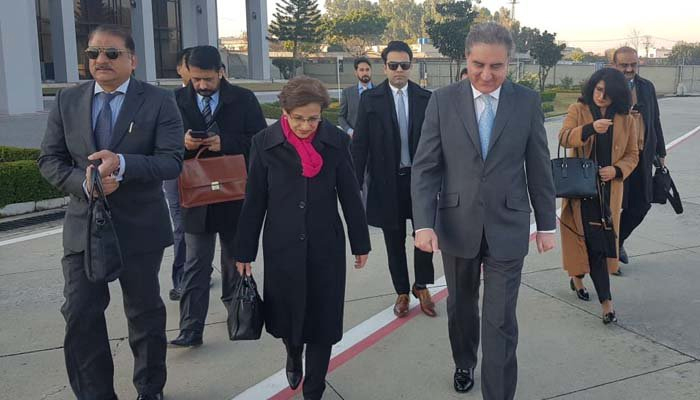 He is representing the Pakistani delegation and is accompanied by Foreign Secretary Tehmina Janjua and other senior officials of the Foreign Office. The Chinese and Afghan foreign ministers are leading their delegations. A tripartite cooperation framework on counter-terrorism is expected to be signed at the meeting. As cited by sources, the talks will be held in three phases. The first phase will have discussion about the political situation in Afghanistan and the negotiation process with Taliban, whereas the second will discuss regional cooperation. The third phase will revolve around security cooperation, sources said. The three foreign ministers are also scheduled to meet with Afghan President Ashraf Ghani. Meanwhile, FM Qureshi during his day-long visit will hold bilateral dialogue with his Chinese counterpart. The foreign minister, while speaking to the media ahead of his departure, welcomed the Chinese initiative of holding trilateral dialogue. "Both Pakistan and China desire peace, stability, prosperity and development in Afghanistan," he stated. "We are carrying the message of friendship and peace to Afghanistan," he added.